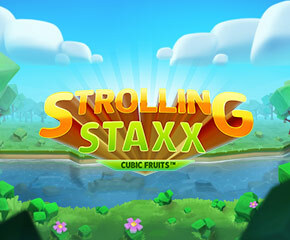 Previously, NetEnt has released a couple of previous iterations of the Strolling Staxx slots. This particular one is the third iteration and is as pretty as they come! Stroll Along With The Strolling Staxx Slots! There are 5 reels, 3 rows and 10 fixed paylines in this NetEnt creation. Gameplay is easily accessible on both PC and mobile devices, with the featured betting limits being very acceptable to both high and low rollers. Playing card values are shown here, in wooden cubic forms. There are also icons like plums, cherries, watermelons, lemons and strawberries designed in wooden cubic forms. The graphical quality is more than acceptable. The watermelon is the most valuable of all icons in view. By landing 5 of it players get to receive a payout of 33.3x the stake. The wild icon also pays out a similar amount when an identical number of it is landed on the reels. All icons in view can appear as 1×1 icons or either a 2×3 or 3×3 icons. Lacking a traditional free spins bonus round, there is no scatter icon featured in this slots online. Respin/Extra Chance – This slots online support a Bonus Bet option. When triggered, the bet size witnesses an increase, with the Extra Chance feature being activated. Here, fruit icons cascade down, with colossal 3×3 icons able to either fully or partially land on some reel locations. The Respin feature here is quite vital to gameplay mechanics. At the lower left part of the reels is shown a particular icon that is able to become fully stacked in all reel locations. When this icon appears on one or multiple reels, stacks of icons experience a leftward shift per spin till they eventually vanish. This feature can be reactivated when extra icon stacks show up, with the maximum win here being set at 5,000x the stake. The Strolling Staxx slot is a decided improvement over its forbears and plays rather well. 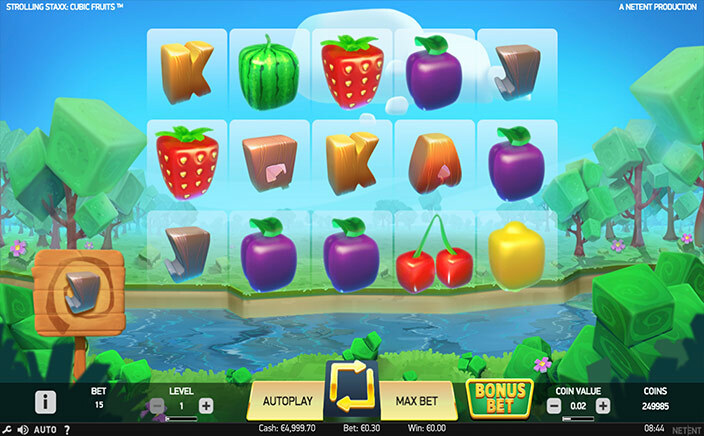 The quality design and animation, not to mention generous bonuses make this online slot a standout!